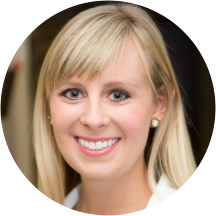 Nicole Mardak is a precise and insightful optometrist located in Marietta, GA. She received her medical degree, with honors, from the Illinois College of Optometry in Chicago. She completed her training at a variety of specialty clinics in the U.S. and Australia. Dr. Mardak provides a wide range of eye care services including multifocal, toric, and spherical contact lens fittings, pre- and post-operative exams, binocular vision evaluations, glaucoma testing and treatment of eye infections and injuries. Dr. Mardak uses the latest technology in her practice, such as retinal photography, OCT for diagnosing optic nerve and retinal pathology, topography, as well as the Visi-office for obtaining the most accurate measurements for glasses prescriptions. In her spare time, she enjoys traveling, concerts, movies, and bike riding. Everyone was very in tuned and professional. Nicole is very professional, have a sense of humor and well mannered. All of the ladies in the office as well as Dr. Mardak are friendly, helpful, welcoming and professional. The wait time was minimal and my appointment was swift and efficient. Would definitely recommend! People are friendly and kind. They acknowledged me insurance or payment system very clear as well. Awesome! Dr. Mardak is awesome! She’s very knowledgeable and very easy to talk to. Highly recommended! Dr. Mardak is fantastic. Friendly, knowledgeable, and takes time to provide excellent care. I had a great visit. Everything ran smoothly, and the Doctor was professional and helpful. Would happily return to this doctor. The wait time was ridiculous considering I filled out all my information beforehand and had an appointment. Dr. Mardak was nice but seemed extremely rushed and I feel she didn't take any of my eye concerns seriously. The appointment was longand while I waited for my pupils to dilate they have you sit with their glasses frame store inside the office. The lady wanted me to buy very expensive glasses and that was with insurance. I did not like being sold to during an appointment. Overall, I will probably not return to this office. Very thorough and a pleasure to visit. I would highly recommend Dr. Mardak. Everyone is so kind and knowledgeable! Nothing felt rushed or pushy! highly recommend! She did a thorough examination, but the glasses are pretty pricey. Online retailers like eyebuydirect and warby parker make it VASTLY cheaper. Dr. Nicole Mardak and her staff was really good and friendly. Even though we booked an appointment, we had to wait a long time before they called us in. I will definitely go back to this office again, the entire office starting from the receptionist to the doctor are all very nice. Dr Mardak is very knowledgeable, patience and friendly. Thanks a gazillion times Dr Mardak and your team, you guys are the best, I really appreciate you all. I walked in and was immediately greeted at the front desk. They updated my information quickly and I was called back in less than 5 minutes. Dr. Mardak was extremely friendly, nice and thorough with my eye exam. I was in and out of the office in about 30 minutes! Very professional, informative and comforting. Would definitely recommend to other potential patients! Dr. Mardak is very personable as well as extremely professional. The exam was thorough and well explained. Her assistant is also excellent. The office is "homey" and just a relaxing place. It was great! The staff, equipment and the diagnosis from Dr. Mardak was flawless. Enjoyed the whole session at every step. i loved my visit with Dr. Mardak. She always has such a pleasant demeanor. Front desk staff and Dr. Mardak were very friendly and very professional. All of the staff and Dr. Mardak were so kind and understanding. I am very squeamish when it comes to the eye doctor, and they were patient and explained everything. They took great care of me! The office was peaceful andquiet, the wait time was less than 5 minutes, there was plenty of parking outside and I felt truly cared for. Thank you! This office is well run, and everyone is friendly. Dr. Mardak is kind and helpful. This was my first visit, and it was wonderful. Dr. Mardak and her office full of attentive and friendly staff made for a pleasant experience. She was quick yet personable with her exam, and I felt comfortable the whole time I was there. Would highly recommend Dr. Mardak to anyone! Fantastic experience. Easy to schedule an appointment, accommodating and friendly staff. Dr Mardak was very knowledgable, thorough and explained everything. Would highly recommend! It was good. Relevant questions asked. Clear explanation about what was being tested and explanation of results. The visit itself was comfortable and professional in every respect. Nice office and everyone is very professional. I went for an annual check-up. My first time at Wildwood eyecare. Waited for a while in the room in between dilation and between nurse and the doctor change, and it became quite a long visit (2 hours almost). However, thatcan be waived since everyone there is so professional and kind of course including Dr. Mardak. Angela (nurse) was very caring but efficient and confident in what she does, and Kat (who fitted my sunglasses for me after my exam) was personal and very detailed. Best overall customer service experience from a doctor's office! It can't get better. Very pleasant staff! Will continue to use Dr. Mardack for vision needs in the future. Appointments are set for specific times in order to increase efficiency. If you set and appointment for eleven, and you don't get seen eleven thirty five, why would one take the time to show up ten minutes early. To be earlyis to be on time. To be on time is to be late. And to be late is unacceptable. This seems to be a problem with doctors everywhere. since when did that become the norm? how have patients been so okay with this that it has turned to common practice? I was very impressed with the clinical portion of this appointment. For the SAME PRICE as previous Wal Mart exams, I was given two completely different Pupil distance reading (that will correct double vision/halos when wearing glasses) andeven given a quick 3-D scan of my eyeballs. I will be getting as comprehensive a copy of my exam as I can, however, as the frames and lenses tend to be of a boutique variety. I bought the one "bells and whistles" pair here, and will certainly go back for routine screenings and fittings. The staff was professional and polite and encouraged me to go outside my comfort zone. These things are all appreciated! Dr. Mardak was very friendly and thorough. This office is always efficient. The wait times are always reasonable. Doctors and staff are excellent. The only thing I am not fond of is being taken to the optics department for dilation because the sales pitch for eye wear is given there, and I wasn't given the prescription for glasses totake elsewhere. I thought what they gave me was the eyeglass prescription, but it was for something else and I couldn't read the Rx slip due to the dilation. Other than that, no issues. Dr. Nicole Mardak, OD has no appointments on Zocdoc right now.